Ahoy, matey! The San Diego Maritime Museum on San Diego Bay has family sleepovers aboard the world’s oldest active tall ship, the Star of India. Sailors for the day can help set sail, haul cargo and stand watch at night. Grrrr…get wild with family sleepovers at The San Diego Zoo in Balboa Park and “Roar & Snore” camping at the Zoo’s Wild Animal Park in Escondido. 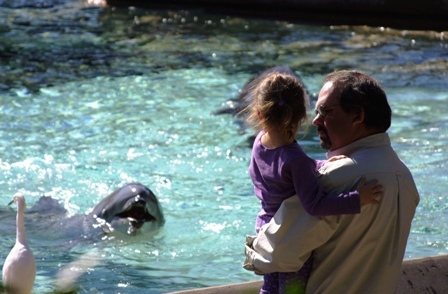 Both include behind the scenes access and animal encounters. Breakfast with the dolphins? Over on Mission Bay at SeaWorld, the family sleepovers are just the beginning. You can spend the whole following day exploring park’s rides, shows and exhibits – admission is included. This entry was posted in Attractions, Hotels & Places to Stay and tagged balboa park, escondido, family, maritime museum, mission bay and beaches, san diego bay, seaworld, sleepover, wild animal park, zoo by Kate. Bookmark the permalink. I own, and use, a library card, a record player, a sewing machine and a meat smoker. Ride my bicycle every day and will, sometimes, wear my roller skates in the house. Have a wealth of useless knowledge – for which you will be thankful when we’re teamed up in Trivial Pursuit. Hike through the spring wildflowers in the Anza-Borrego Desert State Park. Watch the July 4th fireworks over San Diego Bay. Eat Julian Apple Pie a la mode and check out the autumn leaves. Ice skate and enjoy the twinkling holiday decorations at the Hotel del Coronado. All in the same day. I’ve always wanted to be able to stop and restart time like that Twilight Zone episode back in the 80’s, “A Little Peace And Quiet,” but, you know, without the a-bomb at the end. Basically, I just want to avoid waiting in lines. Brunch, without a doubt. Also, cocktails by the pool, outdoor movies in Balboa Park, scouring the swap meet for vintage finds, hanging out on the patio at the Casbah between sets, lawn games and backyard barbecues. Give me uni plucked from the sea by local divers, a warm, crusty loaf from Bread & Cie, luscious Carlsbad strawberries, sweet local lobster in season and creamy Fallbrook avocados. And, most definitely, a grass-fed beef burger with Winchester gouda and a cold San Diego craft brew. Honestly, I buy my records at the thrift store and depend on my husband to download new music. Lately he's been stacking the deck pretty heavy with 90's indie rock, bluegrass covers and drone metal. Go figure. For more San Diego dining dish, follow Kate on Twitter @katebuska.